Work on laying the foundations of a new cinema has started as part of the £75m regeneration of a Cornish town centre. St Austell's former cinema was knocked down last month and the new multiscreen cinema at Aylmer Square is expected to be completed by the end of 2008. 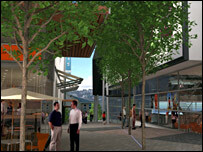 The town centre development should be open by 2009, with three floors of shops and restaurants and 70 flats. The project in St Austell is led by the South West Regional Development Agency and developers David McLean. Digging is also starting on an underground car park.